Show us a dial and we'll tell you what's ticking behind it. 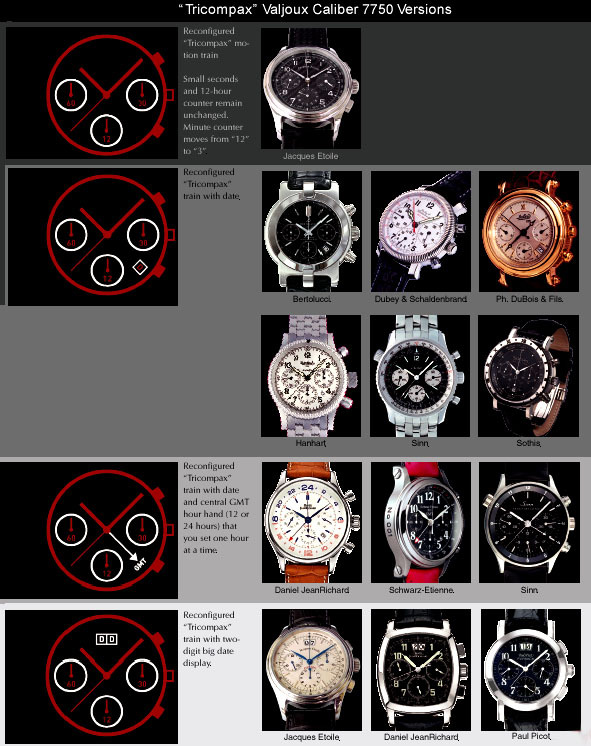 Here at Caliber Corner headquarters, we set out to provide an overview of various common chronograph calibers. 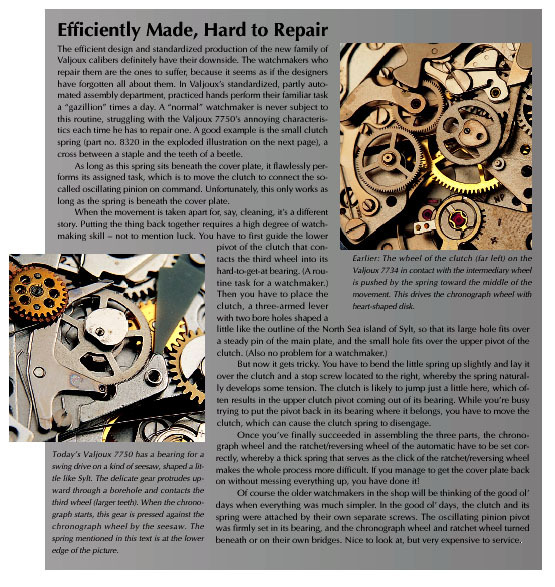 During our investigation of different functions and indicator arrangements, however, we realized that our notebooks were being filled with a wide array of ETA/Valjoux Caliber 7750 variations. We decided that our initial grand scheme needed some trimming to keep the project manageable. 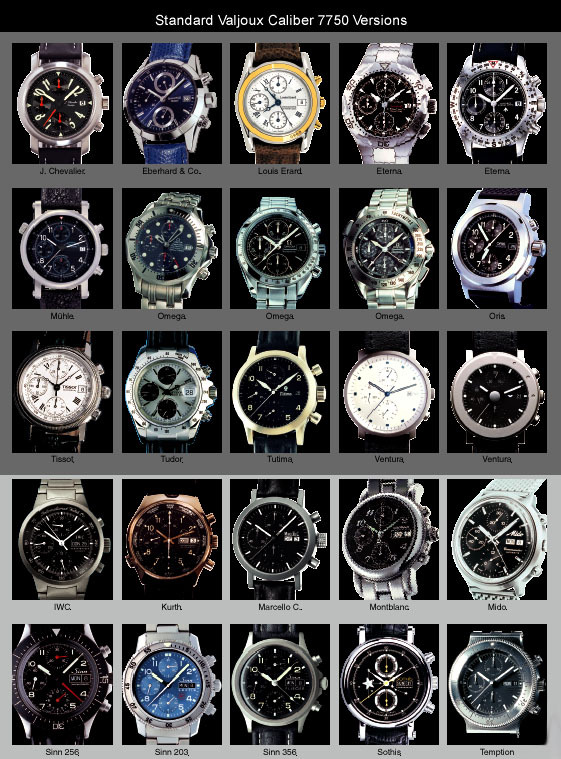 So we focused our energies on the most well - known and most widely used chronograph movement of them all. 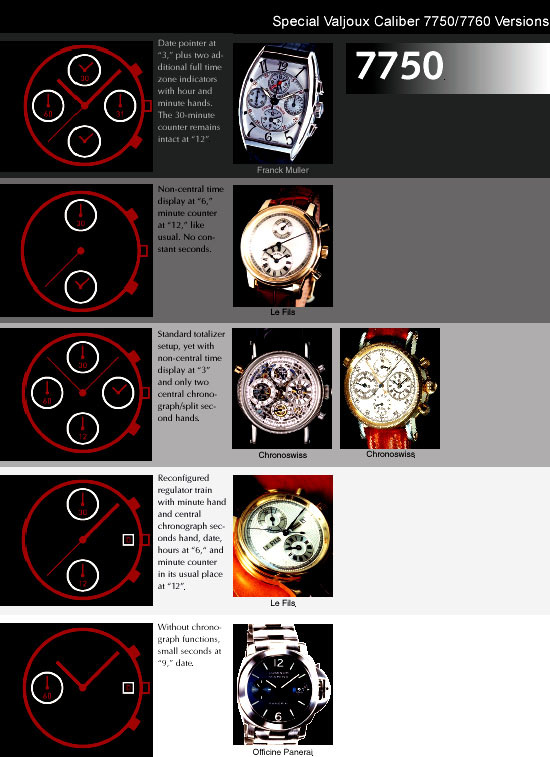 All mechanical chronograph movements with automatic winding came into being in the late 1960s and early 70s. This was a time when experts had long anticipated the quartz revolution. The very last of these to be made also turned out to be the most well-known and, by far, the most successful chronograph caliber of them all: the Valjoux 7750. It was unveiled on July 1, 1974, at the same time that the first solar cell watch became available in the U.S.A. 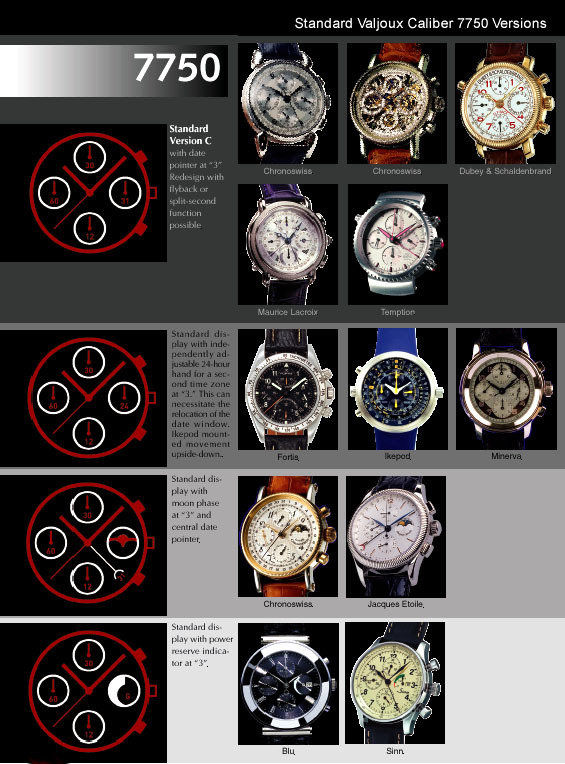 This was also when the Japanese were producing the first large-series batches of quartz chronographs. Maybe watches in the Vallée de Joux simply ran differently. This high valley located in Swiss Jura, in the small village of Les Bioux, is where the blank movement factory of Valjoux SA made its home. Already two generations of watchmakers there had been producing very good to exceptional chronograph movements, though they never installed them in their own watches. 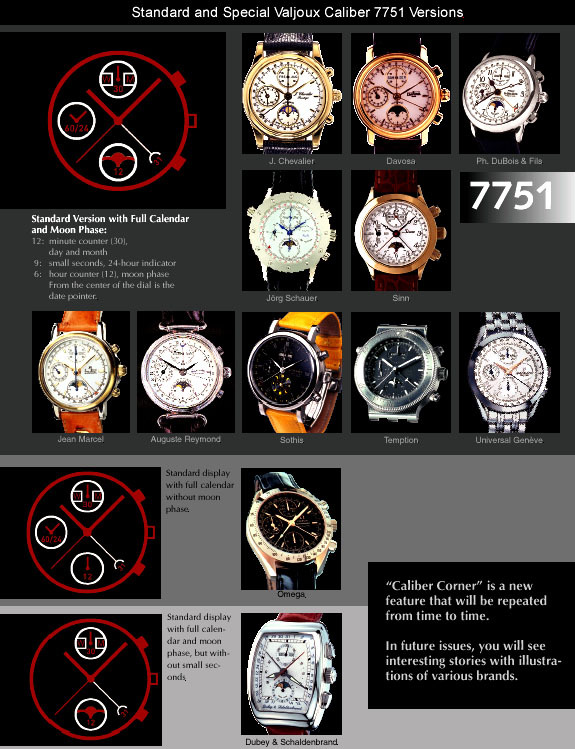 All the big name Swiss watch houses purchased their chronograph calibers from Valjoux, and today just the mention of the caliber designations 72, 72c, and 88 will turn collectors into Pavlovian dogs. immediate predecessor models, the new 7750 sparkled with integrated automatic winding as well as numerous innovative solutions that cut production costs while ensuring greater reliability. 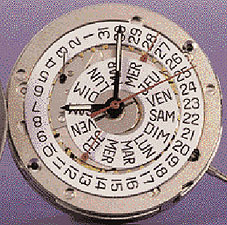 The practical cam control of the chronograph functions was not seen as a disadvantage at the time. The more complicated and beautiful pillar wheel, by contrast, was viewed as a relic of the past. 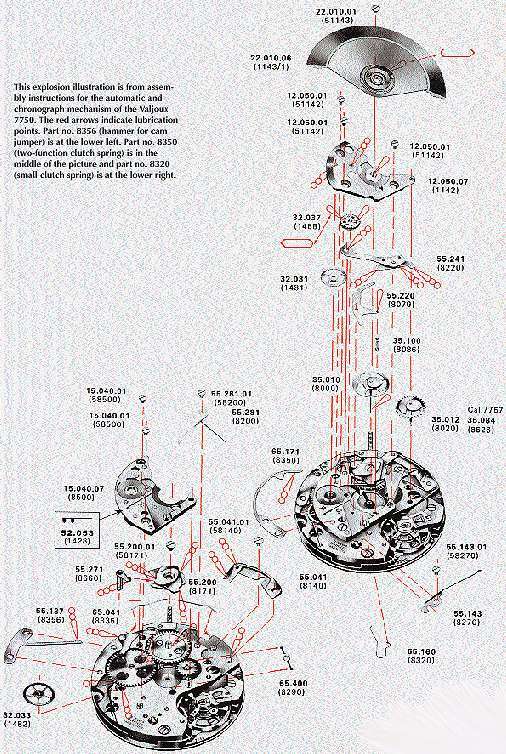 Complex parts such as the pillar wheel were expensive to produce. 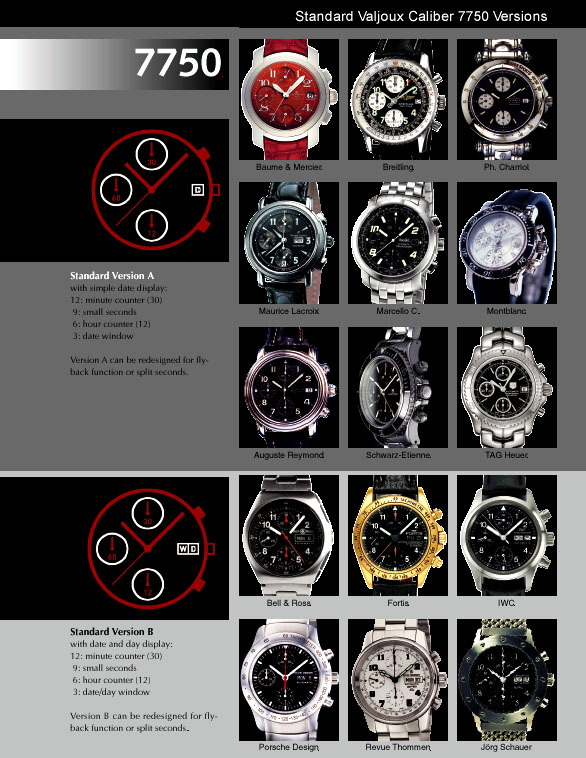 A company seeking to dominate the automatic chronograph sector would have to distribute its new movement quickly and in large numbers. Since the easiest way to do this was to offer the caliber at a reasonable price, production costs had to be slashed as much as possible. Part of these cost-cutting measures included replacing real screws with wedge connections. In addition, small individual bridges gave way to larger movement plates, under which other parts could be mounted and attached. 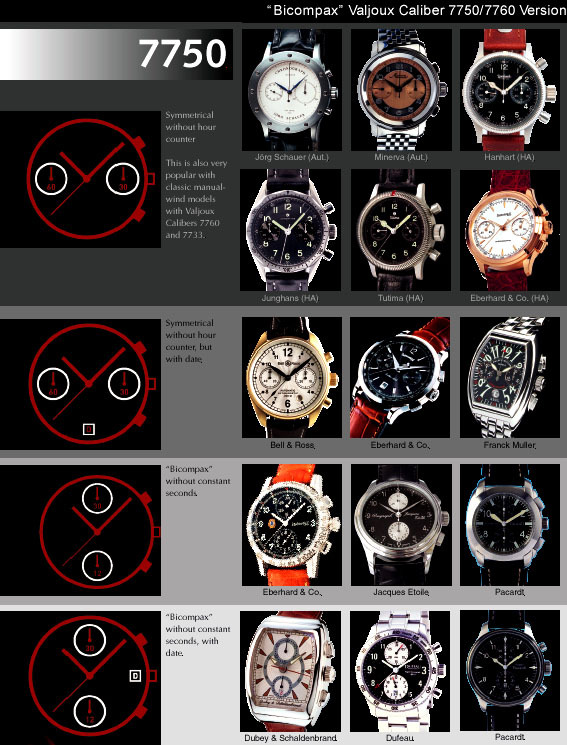 The traditional design characteristics that we now associate with the higher watchmaking art - in part, because of the sophisticated marketing strategies of luxury watchmakers - could not be included in a utility movement intended for the general market. Since the easiest way to do this was to offer the caliber at a reasonable price, production costs had to be slashed as much as possible. Part of these cost-cutting measures included replacing real screws with wedge connections. In addition, small individual bridges gave way to larger movement plates, under which other parts could be mounted and attached. 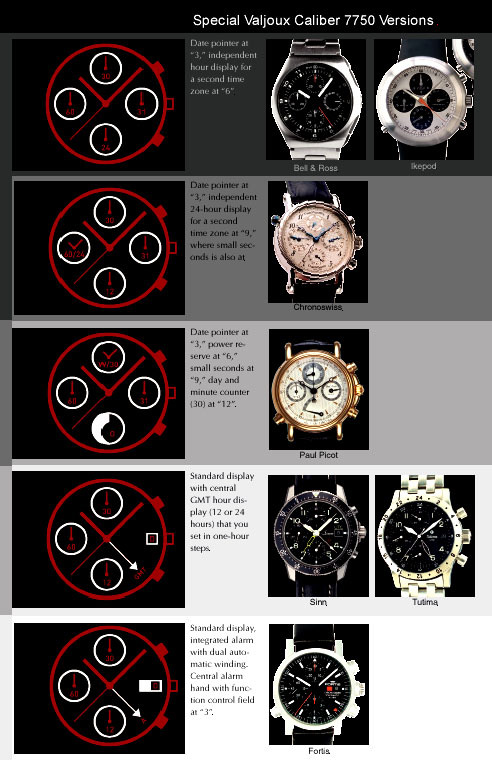 The traditional design characteristics that we now associate with the higher watchmaking art &endash; in part, because of the sophisticated marketing strategies of luxury watchmakers &endash; could not be included in a utility movement intended for the general market. Before the arrival of the first chronograph modules which could be mounted onto existing automatic calibers, the economically designed and produced Valjoux 7750 remained the most reasonably priced Swiss-Made automatic chronograph movement. It also helped that it wasn't subject to any sales restrictions anywhere. The Valjoux 7750 is available direct from the factory with three enhanced finishes in addition to the standard finish: "Elaboré," "Top" and "Chronomètre." A separate department handles special customer requests. 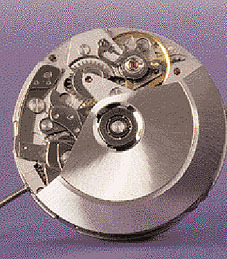 The company offers different versions of its chronographs with date (7750 and 7760 with manual winding), the chronographs with full calendar and moon phase (7751 and 7761 with manual winding) as well as the lesser-known automatic chronographs with moon phase (7758) and the manual-wind chronograph without the 12-hour counter (7765). No wonder so many small and large ateliers are falling over themselves to develop additional versions of the popular and durable "motor." The amazing diversity of 7750 versions surprised even us. 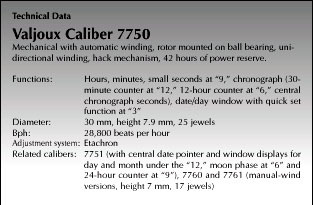 And although we make no claim of proving a complete list here, the following pages illustrate the most common types of Valjoux 7750s.